A common term for spinach in India is “palak” and is filled with full of nutrients and vitamins which is a must inclusion in our regular diet. Palak is a very healthy vegetable and so is chicken and one is a green leafy vegetable with lots of iron in it and the other is a non veg which has lots of proteins in it. Combination of both the main ingredients is a healthy package of iron and proteins which helps in improving iron and also helps in building our body with chicken. Usually, non veg like meat is basically mixed with many vegetables like potato, any green leafy vegetable, or any vegetable but chicken is combined rarely with vegetables and does not taste good if combined. If chicken is combined, then it can be used along with green leafy vegetables like gongura/sorrel leaves or spinach leaves/palak. It is very very rarely combined with potato and also chicken is made in green color using pudina or kothmir. 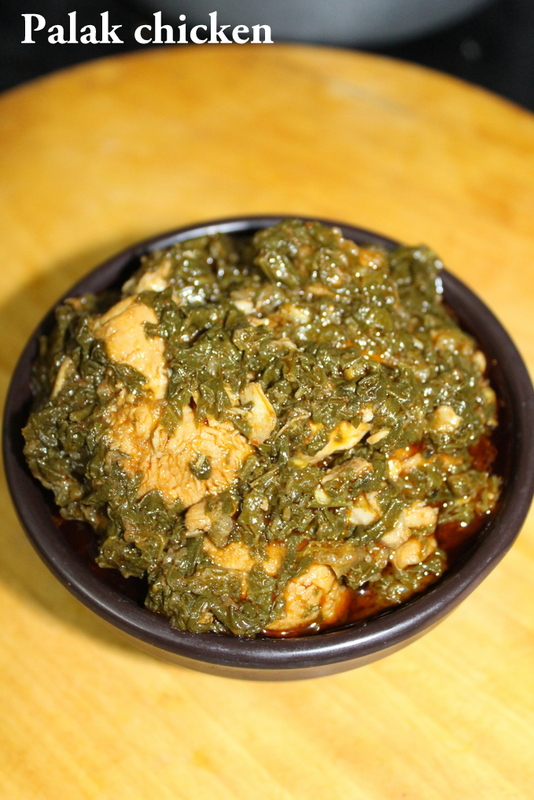 This chicken curry made here is also green and is made using spinach leaves in chicken pieces. Palak can be pureed separately by boiling the leaves in some salt water and added while making chicken curry. Palak leaves can be directly added into the chicken and this is a very quick and easy method of making palak chicken and tastes good too. 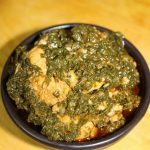 I have already shared gongura chicken on my blog and it is a very delicious way of combining chicken with green leafy vegetable and also a healthy way of having a non veg dish. 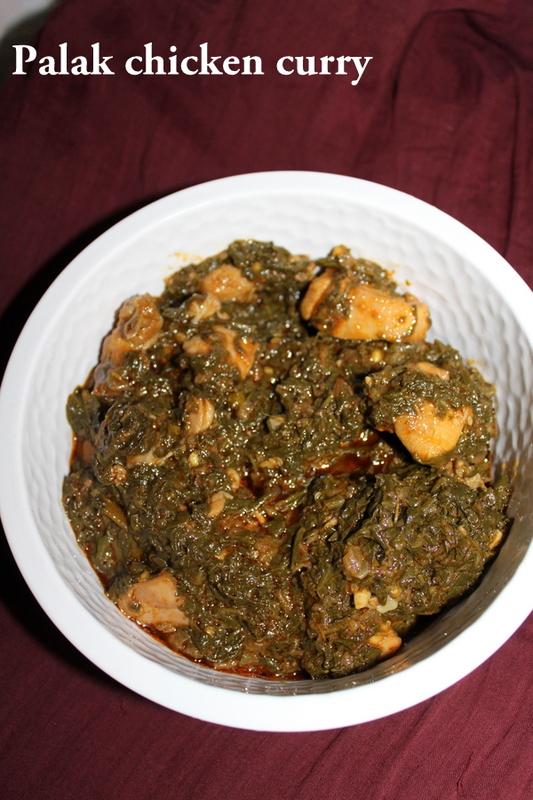 A simple chicken dish combined with palak and made as a palak chicken curry. Take palak leaves in a bowl, chop them finely and add water into them. Remove the leaves from water and put them in a strainer. When the palak leaves do not contain lots of water, they are ready to go into the curry. Firstly, in a pressure cooker, add oil and heat it. Add the sliced onions, cook the onions until they turn slight golden color. Add ginger garlic paste and saute for few seconds to get rid of raw smell. Add the chicken pieces, mix and roast until the color of chicken changes. Add salt, red chilli powder, turmeric powder, mix up well. Roast the chicken for few minutes on low to medium flame by stirring in between. Add the chopped leaves of palak/spinach, coriander leaves, methi leaves, mix well. Cook the palak leaves until it gathers together. Add one chopped onion, mix well. Adjust salt as per requirement and also add a pinch of garam masala powder, mix well. Do not add water and cover the lid of the pressure cooker and pressure cook upto 3-4 whistles. Serve the curry with roti or rice. 1. Here, I have pressure cooked the chicken, but we can also cook the palak chicken by using slow cooking method. 2. Just simmer the flame and cook the palak and chicken for 30 minutes on slow cooking method by covering the lid instead of pressure cooking. 3. One can adjust red chilli powder as per requirement or we can also add 2-3 slit green chillies while cooking the curry.